For the Suffering Irish, the reasons to pray and root for Notre Dame tonight are obvious. Despite both teams being undefeated (the first time two undefeated teams ever met in an NCAA basketball championship), Notre Dame, especially with the injury to Natalie "Ace" Achonwa, is now the decided underdog, and will need all the help from Our Lady (aka Notre Dame) they can get. But even for the casual Catholic or basketball fan of good will, know that they should pull for Notre Dame in this classic game of good vs. evil if only for the good to prevail. 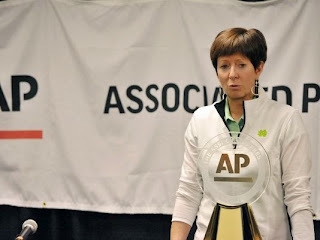 If you think "good vs. evil" are too strong of words for a women's basketball game, at least you have to grant it is a prime example of the kind (if demanding) coach vs. the mean mentor, the demure debutante vs. the brash bully. While Coach McGraw regrets the "lack of civility" in this rivalry since the Fighting Irish started to beat the Huskies on occasion, UConn coach, Geno Auriemma, merely sneers, "Sometimes we act like girls, like we're supposed to go to dinner every night. We're supposed to play each other, try to beat each other's brains out, try to win a national championship and compete like hell, Muffet and Geno, and then we're supposed to get together afterward and go have a bottle of wine. That's just not going to happen. So stop asking why it doesn't happen." As implied, Notre Dame was already a projected underdog against UConn, but when Achonwa went down with an ACL injury in the Irish's quarterfinal game against Baylor, things looked even grimmer. Inspired performances by the remaining two of the Irish's tremendous trio, Kayla McBride and Jewell Loyd, were enough for the Irish to prevail against Maryland, but the Huskies are indeed a different story. Besides player of the year Stewart, the remaining UConn starters are all stars, and would be THE star of any other team of the country—except of course a school like Notre Dame, where they wouldn't qualify academically. Of course, that's also another story (and one Auriemma HATES being asked about), but when Notre Dame has graduated every player in McGraw's more than a quarter-of-a-century career under the Dome, it's difficult to not notice this academic discrepancy. Still, there is one noticeable thing lacking from the Lady Irish's success, one hopefully that will be corrected after the game tonight. 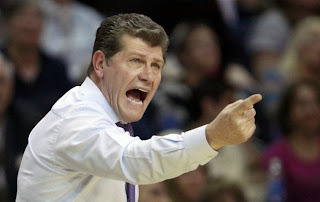 The only talk of religion during the intense pre-game interviews came when Muffet (after both teams left the Big East for different conferences last year) mourned the fact Connecticut refused to schedule Notre Dame during the regular season, to which Auriemma attempted the joke, "it's not nice to fib during Lent." Pray that, in the event of what would be a miraculous Irish victory tonight, that Muffet or one of her girls has the courage to give some of the credit to the Virgin Mary, for through thick and thin, She remains the best fan a team ever had, the true difference between Notre Dame and any secular institution.